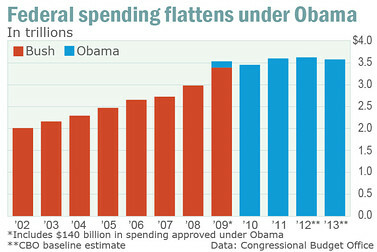 Right Wing Claims That Obama Is A Big Spender Are No More True Than Birther Claims. Note that one way that conservatives falsely inflate Obama’s spending is by attributing the 2009 budget to Obama, but the 2009 budget was passed before Obama took office. 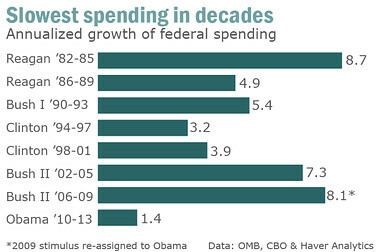 It is also notable that much of the spending under Obama was based upon policies from George Bush, including two wars and Bush’s unfunded Medicare D program. Even the stimulus spending was necessitated by the recession caused by Republican policies. In terms of the deficit, matters were made worse by the Bush tax cuts, and by decreased tax revenues due to the Bush recession. Update: Michael Linden responded to the criticism of this data here. Bottom line is that it is valid to attribute most of the fiscal year 2009 spending to Bush rather than Obama as the spending for fiscal year 2009 was already planned and would have occurred regardless of who was president. Even if the 2009 spending were incorrectly attributed to Obama, note that we still see spending level off and drop under Obama, which also contradicts the right wing claims about spending under Obama.